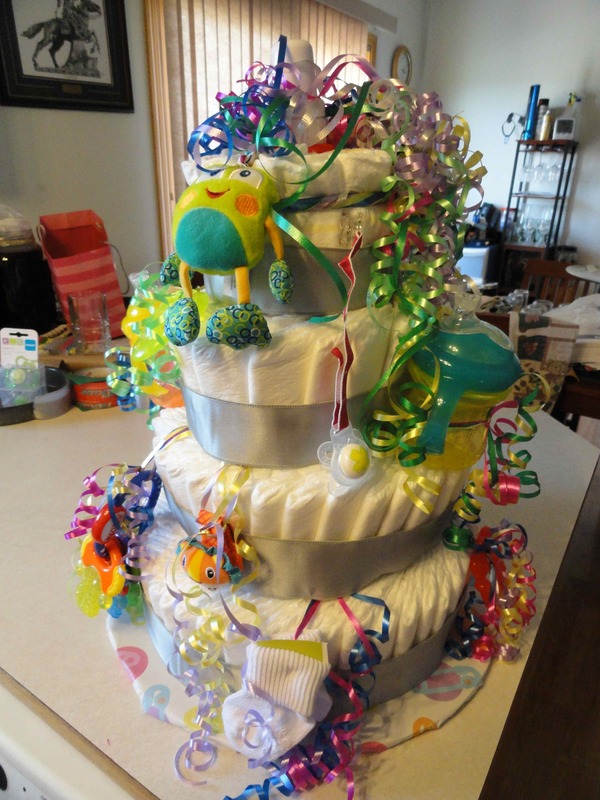 If you have never seen a diaper cake – you are missing out. My friend Martha and I set out on a most awesome adventure last weekend to make one. 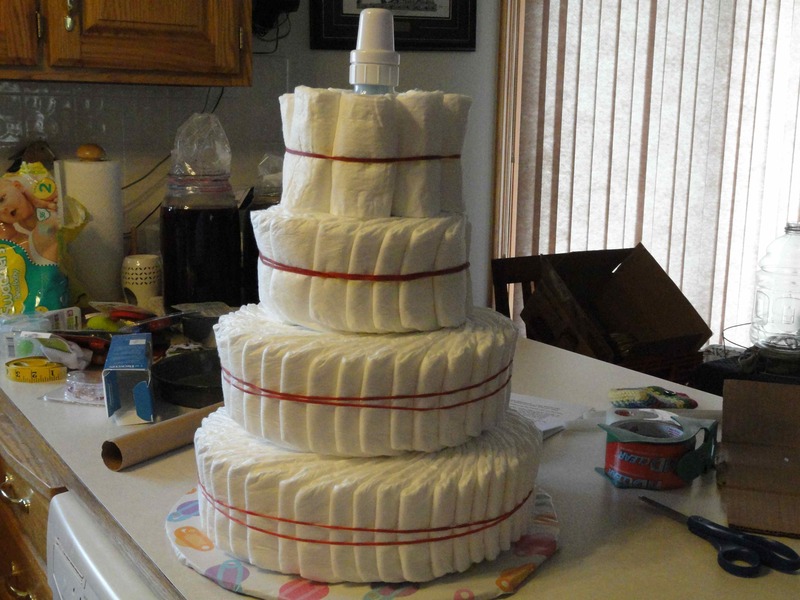 The guys of course made every bad joke possible about it when we told them we were making a diaper cake. Yes, I get it. Merely saying those 2 words together in a sentence is just wrong. They were conjuring the visual on it and it was bad, very bad. So we let them get it out of their systems and I admit we even giggled at a few of their juvenile jokes. small baby gifts – teething rings, sippy cups, socks, pacifiers, rattles, utensils, bibs, etc. Start by hot gluing the 2 large cardboard base circles together and then cover them wrapping paper, this is your “cake platter”. Hot glue the paper towel tube to the center of the cake platter and once the glue dries, reinforce it with packing tape and then set it aside for a few minutes. 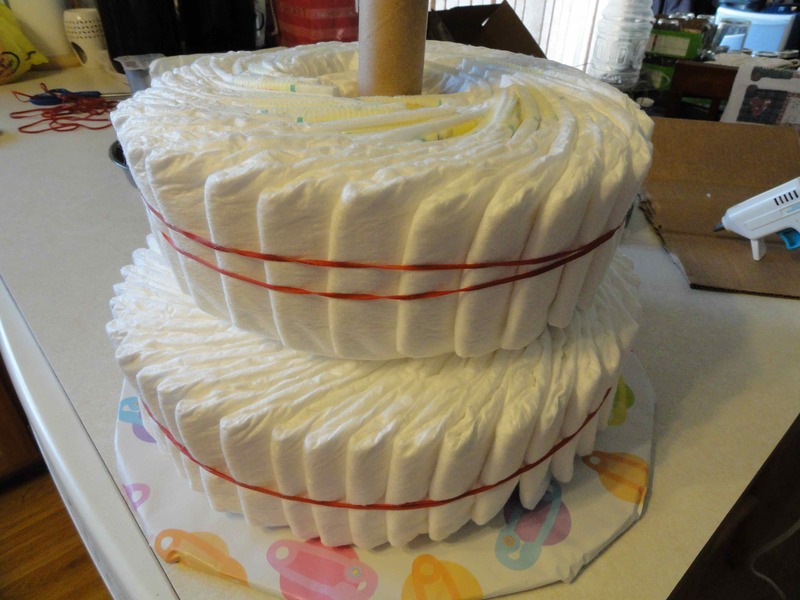 On the largest of the molds (the pizza pan), start fanning the diapers out in a swirl, making sure to have any printing hidden towards the inside. Use your hand to make sure the center stays open enough for you to slide it over the tube – if it is too large in the center add a couple of extra diapers into the middle. Once you have it looking full enough, put a rubber band around it and do some fluffing and re-arranging to give a nice even fanned out appearance. 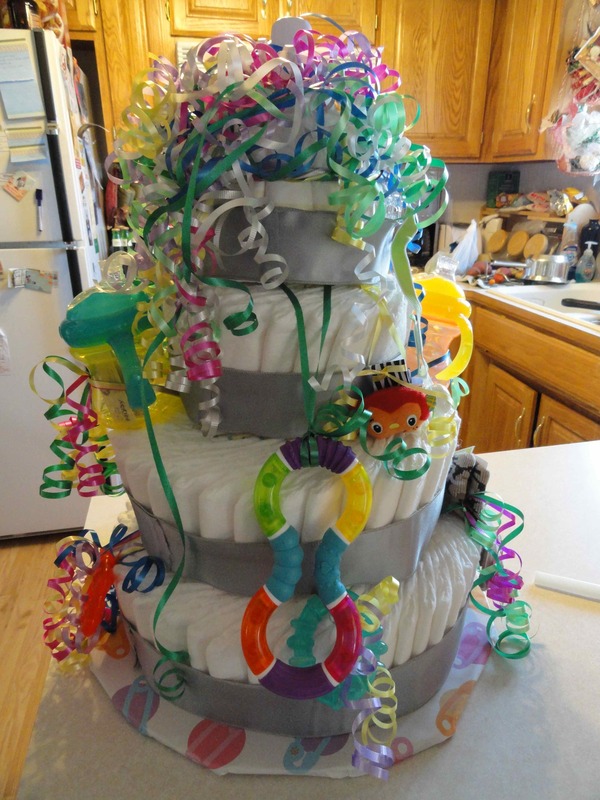 Then carefully lift it off of the mold and slide it down over the tube onto the cake platter. Repeat this with the middle sized tray, and again with the 8” cake pan. For the final top layer, stand the baby bottle on top of the tube and roll 6 or 7 individual diapers tightly and rubber band them around the bottle. Then you can start all of the really fun stuff. Cover the rubber bands with the wire edge ribbon and only use a small amount of glue on the edge where it overlaps. Use curling ribbon to tie all of your baby gifts to each layer. 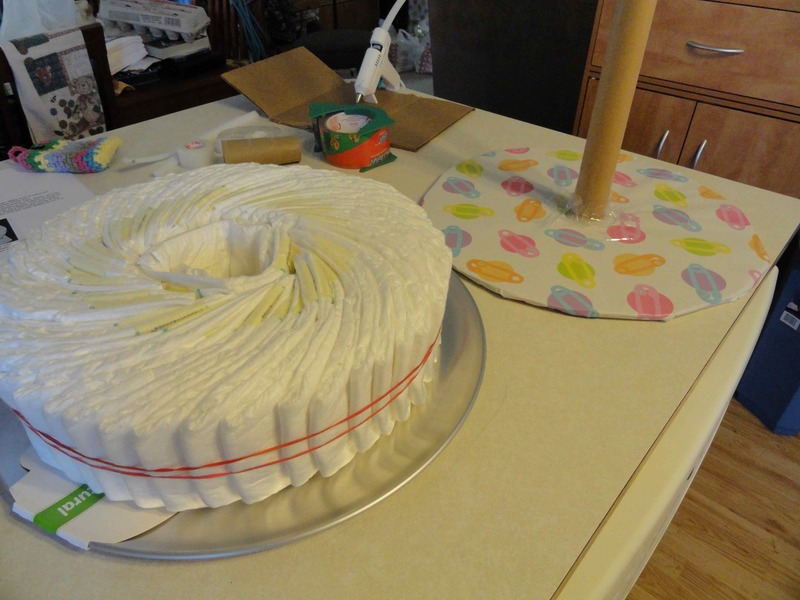 Add a big curling ribbon puff to the top. Just a tip: grab a partner in crime to help because it is much easier to have 4 hands working at once. We had a blast and it only took a couple of hours. What new mommy wouldn’t want a centerpiece like this at her shower? 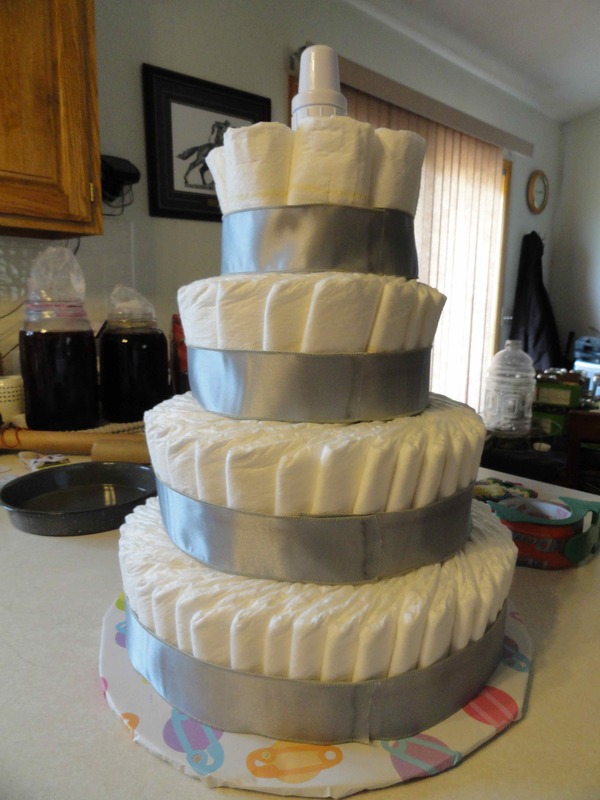 Your diaper cake looks really amazing! Wow ~ Thanks 🙂 Your site looks pretty amazing!